Purina Pro Plan Wants to Know “How Is Your Dog Great?” ~ Win a Year’s Supply of Dog Food and Be Seen in a National TV Ad! My dog, Noel... What can I say about the absolute best dog I've ever owned? LOTS! Noel is one of the kindest, sweetest, funniest, smartest, most loyal pups a girl could have and I'm just lucky that she's all mine. Noel and I have that special bond that no one else in my family has with her. She's been in my life for the last twelve years and in that time, we've been through a lot together. I've had five jobs, four residences, a marriage, a pregnancy and a child with Noel wagging her happy little tail right there by my side. She knows when I'm sick and will snuggle next to me all day to try and make me feel better and she always make sure to follow me to bed each night. When I sleep in on the weekends and the rest of the family has awoken, Noel will even wait patiently outside of the bedroom door until I wake up, just so she can be the first one there to greet me. Now is that a great dog or what? Purina Pro Plan is all about celebrating the greatness of our dear furry friends and wants to ask you the question, "How Is Your Dog Great?" Keep reading to learn more! 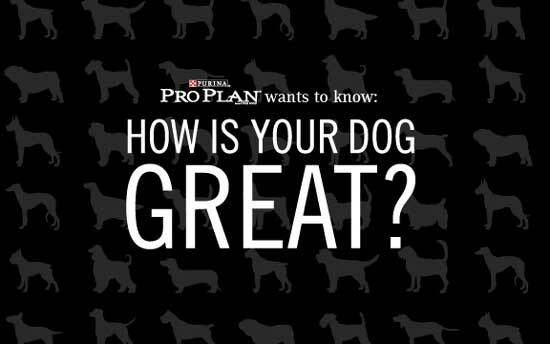 Purina Pro Plan is asking passionate pet owners across the country to put their dog's greatness on display in the "How is Your Dog Great?" video contest. From now until August 27, 2012, pet owners can upload a short film, less than two minutes in length, to the Pro Plan YouTube channel. Entries should demonstrate moments along their dog’s journey toward greatness that inspire others to discover greatness in their dog. A total of 10 finalists will be chosen by an independent panel of judges who will evaluate each entry based on the originality, creativity and composition of the video. Then the top 10 finalists' videos will be open for the public to vote for their favorite starting on or around Sept. 10 through Oct. 8 on the Purina Pro Plan YouTube channel. The grand prize winner, chosen by a combination of the public's votes and an independent judging panel, will have their video featured in an upcoming TV commercial for Purina Pro Plan. The winner will also receive a trip for two plus their winning dog to the 2013 Westminster Kennel Club Dog Show in New York, including round-trip airfare and hotel accommodations. All 10 finalists will also receive a one-year supply of Purina Pro Plan dog food to help support their dog's continuing journey toward greatness with high-quality nutrition. Now of course, I couldn't write a post about great dogs without including a classic moment of my own dog's greatness. You see, Noel is always doing wacky things around our house which make us "howl" with laughter! :dog: Here's just one such moment captured on video. No matter where we are, if Noel hears the theme song to either All In the Family, Frazier, Cheers or Family Guy, she will howl and howl until the song ends. I'm a huge fan of TV sitcoms, but these are the only ones which seem to bother her. I guess she's just not a fan of the piano! Disclosure: I was compensated for this sponsored post made possible by Mom Spark Media. Thoughts are my own. Howdy Pardner! It’s Stick ‘Em Up Friday for July 27th ~ List All Your Giveaways Here!